Security cameras are placed in key positions throughout the Orange Schools Campus. These cameras display and record video that can be viewed online by District administrators. In an emergency, local police can access the video feed via laptop computers in their cruisers. 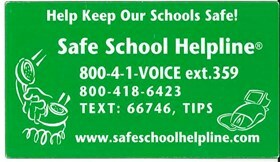 School officials and local police can also use these videos when investigating any incidents. All staff are assigned photo identification cards which allow access to the buildings where they work. All doors in the school buildings are kept secure. Visitors must be buzzed in at the front door of each school, sign the guest registry and wear a visitor tag. The Orange Schools maintain a solid, cooperative relationship with local police and fire departments. These safety forces meet regularly with school officials in a proactive environment to insure the safety and security of Orange Schools students and staff. The safety forces also take part in school staff safety training. In addition, Orange Schools and the City of Pepper Pike have taken a proactive approach by assigning a school resource officer. People from the local police and fire departments often spend time in buildings throughout the District to interact with students. The Orange Schools Safety Committee meets regularly to discuss safety and security issues throughout the District. In a proactive approach by Orange Schools and the City of Pepper Pike, police officer Todd Bennett has been assigned to work in the high school as a school resource officer. He interacts with students daily, educates students on various teen issue, makes himself available to students who have an issue or concern and resolves conflicts. In an effort to make sure our students and staff are well prepared in case of an emergency, every school holds regularly scheduled rotating safety drills. The safety routines that are practiced include tornado drills, fire drills, evacuation drills and shelter-in-place drills. Building staff evaluates the effectness of each drill and determines if any adjustments need to be made. A lightning detection system has been installed on the Orange Schools campus which alerts everyone using the various athletic fields across campus that a lightning storm is highly possible. People are more susceptible to lightning strikes when on an open field. Upon hearing the siren alert, everyone should leave the fields and move indoors. Automated External Defibrillators (AED) are located in every building on campus in various locations in case of a medical urgency where a person suffers a cardiac arrest and needs emergency resuscitation. Although trainers and certain staff are trained in using the devices, these kits are designed so that anyone can use them by following the step-by-step directions given within each unit. Orange has had various opportunities over the years to set aside time for staff safety and security training. This has included presentations by various safety groups including the FBI, Secret Service and Homeland Security. It also included table top training sessions where staff and local safety forces worked together in small groups to try to resolve a fictional safety scenario.